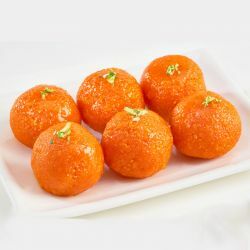 Motichur Laddu from Anand Sweets is a Rich, Delicious, Hyginically prepared and is a perfect choice to your dears to make them Happier on Birthdays, Festivals and on all Occasion. Send Motichur Laddu from Finest Quality Anand Sweets to your dears in India through OrderYourChoice. Bought Motichur laddu in Anand sweets from Oyc. The taste is very good. I loved it. Thanks for the timely delivery. I am a big fan of Motichur laddus. They are usually delicious than the normal boondhi laddus. This laddu from Anand sweets is also very good. Good work by Orderyourchoice. They are serving as the best online cake shop in Bangalore. Keep it up. Hi,<br /> i received this anand sweets on perfect timing. The ontime delivery was perfect.